Easy Save Flash is a plug-in of Microsoft Internet Explorer. let you conveniently saves Flash, Img, music and others files embedded in web pages to local drive. Easy Save Flash is a plug-in of Microsoft Internet Explorer. It adds a new toolbar and many useful features to Internet Explorer. It can conveniently saves Flash, Img, music and others files embedded in web pages to local drive, allows you to capture a full size screenshot of an entire web page (no scrolling needed) in .BMP or JPG format, repair your IE's start page and unlock regedit, clear IE's listboxcache, cookies, history easily and quickily, conveniently view source of web page. Save web page to BMP or JPEG file. Embed in IE, show as a Toolbar in the IE. Conveniently saves Flash, Img, music and others files embedded in web pages to local drive. Clear IE's listboxcache, cookies, history easily. Repair your IE's start page and unlock registertools easily and quickly. Flash2X Flash Hunter - Able to save flash movies from web pages or search them from Internet temporary folders. 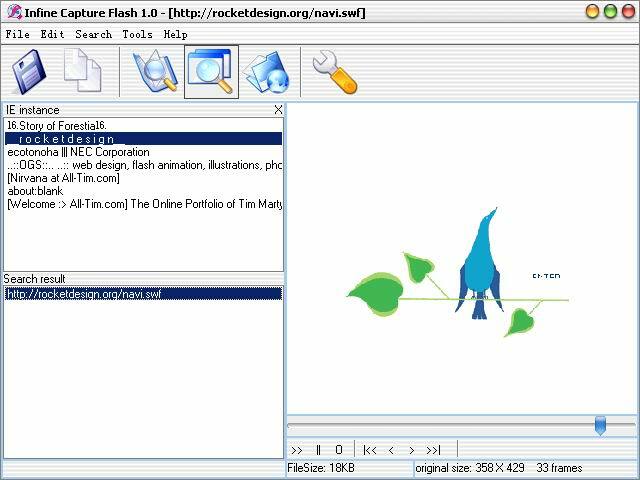 GetFlash - the tool software to help you save and manage the flash animations in web browses.